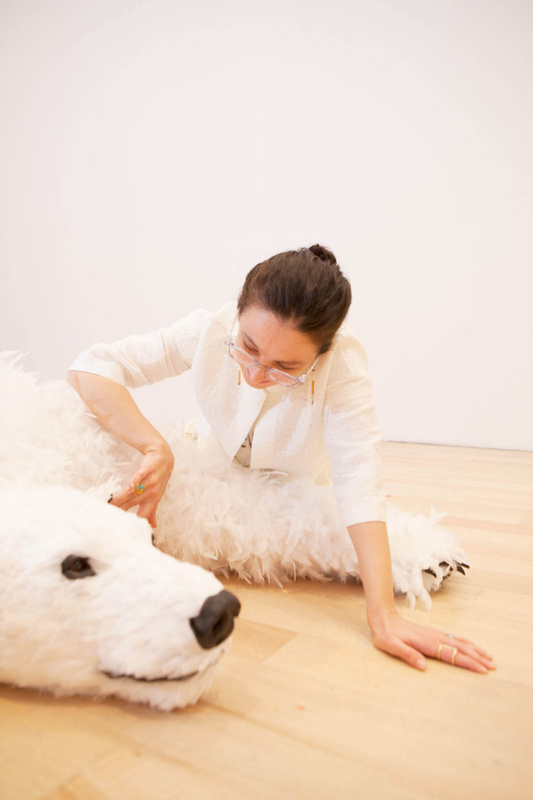 Paola Pivi takes an hands-on approach during her installation at the Bass Museum. “It’s been a very long day,” Paola Pivi exhales as we grab an outdoor table at a well-appointed café in Miami’s Design District. Though the nomadic artist hasn’t lived in her native Milan for some time, she effortlessly retains a Milanese sensibility. Dressed in a jacket and skirt by Maurizio Pecoraro and metallic Jimmy Choos, her warm eyes framed by large Thierry Lasry glasses, Pivi explains that she has spent the afternoon installing one of her iconic feathered bears in the Margulies Warehouse; the seasoned collector had purchased the piece some months back. Since July, Pivi has been renting a flat along Collins Avenue in preparation for her solo show, “Art with a view,” at The Bass. The culmination of her efforts is a whimsical explosion of color, texture and movement featuring her most iconic works alongside newly debuted pieces. “I do every show like it’s the last show of my life,” says Pivi, whose practice rarely settles on any one medium or theme, but instead ushers the viewer through Pivi’s furtive imagination. The artist and her polar bear. Born to a family of doctors and engineers, Pivi’s upbringing was quite rigid—and a propensity for order and discipline is visible in her work. Her deft precision is evident in everything from her meticulous research to her technical prowess and she often takes months, even years, to complete her work. Untitled (pearls) (beautiful day) (2015), for example, features more than 370,000 real pearls, painstakingly hand-stitched together in a gradient of beige and delicate blush. Lies (2018), a poignant work conceived in 2013 and realized over years for her show at The Bass, flashes roughly 40,000 images of quotidian life on 92 television screens. A series of blatant falsehoods are repeated on an endless loop by a deadpan voice, enveloping the viewer in a nightmarish cycle of fake news.